If you’re considering investing in solar shingles or a solar roofing system for your home, you’ve likely thought about the impact this will have on the resale value of your house if you ever decide to sell. At Endless Energy, we’ve designed custom solar panels for dozens of homeowners throughout Roswell, Hobbs, and Carlsbad, NM, as well as parts of Western Texas, so we understand how big of a decision it is to switch to solar power for your home. As a homeowner, you want to ensure that you’re making informed decisions when it comes to residential solar panels, so our solar power experts are here to explain how these PV cells can add value to your home over time. The main thing that seems to make people hesitant about investing in solar shingles or solar panels for their home is the upfront cost, which can get quite expensive, depending on the scope of the project. However, if you are putting your house on the market and have already paid off your home’s solar system, your property becomes much more appealing to potential buyers who are interested in solar panels for home use, but held off due to the upfront cost. Given that the home buyer likely won’t inherit any of the upfront cost of your home’s solar panels (or pay a dime in utility bills, for that matter), this gives you leverage to bump up your asking price when it comes time to sell your home and its solar panels. Think about it: the main reason why so many homeowners decide to remodel their kitchen, bathrooms, and update old appliances is because they want to boost their home’s resale value. That, or they’re just ready for a change. Residential solar panels are the same, in a way — they offer an innovative, eco-friendly way to upgrade your home and make it more efficient, which ultimately adds value to it when you decide to sell. 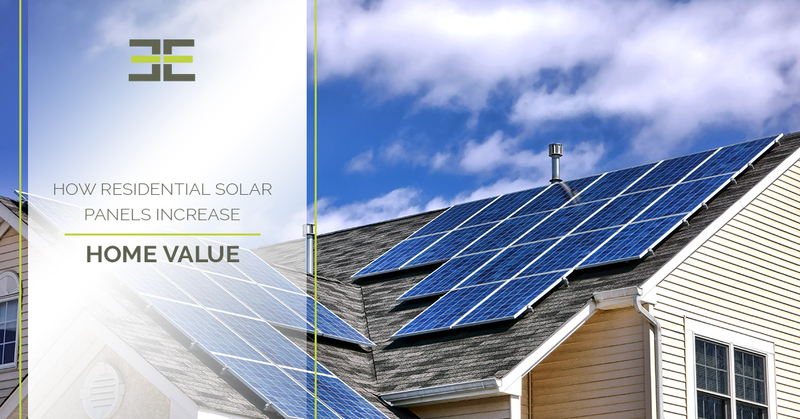 Just like low-flow toilets, geothermal heating systems, and other energy-saving systems add value to your home while improving overall efficiency, solar panels can significantly increase your home’s resale value. A study recently published by the National Bureau of Economic Research found that in California, “solar panels added a $20,194 premium [on average] to the sales price of the house based on repeat sales data (houses were in the mid-$500,000 range) . . . the average total [residential solar] system cost is $35,967, but the effective price to homeowners with subsidies including the federal tax credit is $20,892. Thus, homeowners appear to recover approximately 97% of their investment costs – in addition to the savings associated with reduced energy bills.” Given this case study, and the fact that very few other home improvement projects have this significant of a payback, it makes sense to invest in solar panels for your home if you’re looking for ways to boost its value. Another thing to note is the role the state and federal government play in the payback you get from a residential solar system. In many states, the local government will offer tax credits to homeowners who invest in solar energy systems for their homes, which can greatly reduce the upfront cost of solar shingles or solar roof systems. According to the U.S. Department of Energy, the federal government is now offering a rebate of 30 percent for homeowners who have residential solar panels installed and in service by Dec. 31, 2019. So, what does this mean for homeowners who decide to sell their house within the next decade? Well, if they are able to pay off the remaining portion of the upfront solar panel cost before putting their home on the market, they are likely to have no issue selling their home for a more-than-fair price. This is because the solar panels will still be relatively new at the time of sale, given that their lifespan is typically more than 20 years. Much like selling a gently used hybrid car (for a decent price) to a seller who is looking to save during the tax season, selling a nice home with gently used solar panels affords you an unparalleled monetary benefit. You’ve received the upfront solar tax credits, you’ve used this to pay off the solar energy system quicker, you’ve saved money by only using free energy for years at a time, you’ve gotten tax write-offs every tax season, and you’ve added value to your home, which you’ll pass along to the next lucky home buyer. Solar technology has made leaps and bounds in the last few years, as custom solar panels are being created for specific home types, commercial building structures, solar farm layouts, and more. Because of this, homeowners now have the option to invest in one-of-a-kind solar shingles or solar roofing systems that are made for their home and their home only, which proves to be a truly unique and attractive selling point when you decide to sell your house. Unlike other properties with traditional solar panels that can be an eyesore (and aren’t the most efficient) compared to custom solar energy systems, your home will stand out in the housing market as one that is energy-independent and has a renewable energy system that was made just for it. That’s part of the reason why we recommend that if you are thinking about going green with solar panels for your home, you opt for custom solar panels that are made specifically for the property. When you choose Endless Energy for your residential solar panels in Hobbs, Roswell, or Carlsbad, NM (or parts of Western Texas), we will perform an in-depth analysis of your home’s energy consumption, property size, and more to create a solar energy system that performs optimally for your home. The truth of the matter is that everyone’s energy needs vary, and so should their solar panels. Ready to book a consultation with us? Contact Endless Energy today, or get a quick quote online!